The Madras high court on Thursday ordered that no floor test would be conducted in the Tamil Nadu Assembly till September 20. Justice M Duraiswami passed the interim order on petitions by Dravida Munnetra Kazhagam working president M K Stalin and MLA P Vetrivel, a staunch loyalist of ousted All India Anna Dravida Munnetra Kazhagam leader T T V Dinakaran. Representatives of Dinakaran on Thursday approached the Election Commission and urged it to declare as invalid the party's general council meeting in which his aunt Sasikala was removed as general secretary. Speaking to reporters after meeting the EC officials, Rajya Sabha MP Vijila Sathyananth said a memorandum containing facts, figures and by-laws of the party has been submitted to the poll body back their claim. The party's merged factions on Tuesday declared late chief minister J Jayalalithaa as AIADMK's 'permanent' general secretary and annulled the appointment of V K Sasikala as interim general secretary. "The meeting and decisions taken in it cannot be considered as valid as the Madras high court verdict had said that any decisions in the meeting will be subject to the final outcome in the appeal," Sathyanath said. After a single judge of the Madras HC dismissed the plea of the Dhinakaran faction for a stay on the general council meeting, it approached the division bench, which too refused to interfere with the former's conclusion. The court, however, said that any decision taken at the impugned meeting will be subject to the final outcome in the appeal and posted the matter to October 23. Sathyanath said the memorandum contained the procedures that should be followed before a call for general council meeting. Citing pending disqualification proceedings against 19 MLAs loyal to Dinkaran in view of their rebellion against Chief Minister Edappadi K Palaniswami, the petitioners submitted that they apprehended the speaker might disqualify the legislators. This may go in favour of the chief minister in case of a floor test to prove his majority, they contended. Stalin, in his petition, had sought a direction to the governor to order a floor test for the Palaniswami government, claiming that it had lost is majority in view of the 19 MLAs expressing their lack of confidence in the chief minister. Vetrivel, who filed a impleading petition, submitted he had apprehension that he might be disqualified by the speaker during the proceedings initiated on a prayer by the government chief whip. After the whip sought disqualification of the 19 MLAs under the anti-defection law, the speaker had issued notices to them seeking their response, the time limit for which ended on Thursday. Earlier, Tamil Nadu Advocate General Vijay Narayan informed the judge that the constitutional process by the speaker had started and the court could not pass orders based on apprehensions of the petitioners. Narayan stated this in response to a directive by the judge earlier in the day asking him to ascertain from the Speaker whether he intended to pass any order on the matter. Senior counsel Kapil Sibal, appearing for Stalin, submitted that the speaker might pass an order disqualifying the 19 MLAs and might conduct the floor test on even Sunday so that they would not have time to approach courts for relief. He said at least 48 hours of time should be given before a floor test. The speaker's counsel submitted the court cannot interfere in the process of a constitutional authority such as the speaker. Once the constitutional process was over and if any order was passed, then a judicial review would always be available to the aggrieved parties, he submitted. The court cannot act based on apprehensions and expect the speaker to reply whether he was going to take a decision today or tomorrow, he said. Sibal argued that even issuing privilege notices to 21 DMK MLAs over their action in displaying banned gutkha in the assembly had been done only with a mala fide intention to save the government. 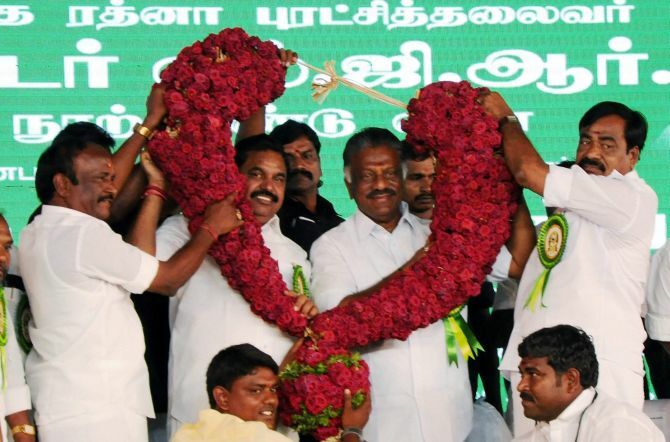 The MLAs have revolted against Palaniswami after the merger of party factions led by him and deputy chief minister O Panneerselvam on August 21. In his petition, Stalin also wanted the floor test to be held under the supervision of an independent observer appointed by the high court. Stalin, the Leader of the Opposition in the assembly, sought a direction to the chief minister, restraining him from taking any major policy decision, pending the disposal of his petition. Besides the withdrawal of support by the 19 MLAs, the 98 MLAs of the DMK and its allies in the opposition had expressed their 'unequivocal no-confidence' in the government, it said. "Hence, it is clear that the the government has lost its majority," he had contended adding it was the duty of the governor to ask the government to prove its strength in the 234-member assembly with one vacancy. The AIADMK has 134 members excluding the speaker.